Captain! We've heard you can't live without the thrill of adventure. 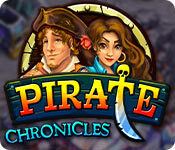 If so, Pirate Chronicles is the perfect game for you! Ready yourself to raise the Jolly Roger and sail the Seven Seas in this addictive time-management game! Find fortune, glory, and true love. Meet new friends and fight vile foes along the way. Build ships, gather trophies, load cannons, and resist the Kraken. 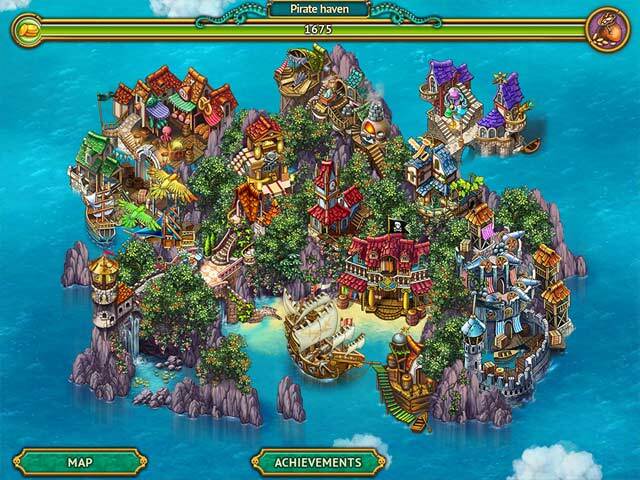 Confront the evil pirates of the notorious Black Armada, defeat the king, and save your beloved. Test your time-management skills in more than 40 outstanding levels and 4 challenging mini-games. Are you brave enough to accept this challenge? Pirate Chronicles is rated 4.3 out of 5 by 19. Rated 5 out of 5 by Cabri3 from High Seas Adventure, Ar! I love this game. It's a building-type game, which I usually don't like, but with pirates, it's very fun- rebuild things like cannons and buildings that were damaged by the bad-guy pirates (you're a good-guy pirate), in order to rescue your beloved pirate captain and drive off the evil guy who kidnaped her. Yo ho ho! I normally think the Collector's Editions are a cheap rip off since you pay 200% as much to get 20-25% more. Also, that extra stuff frequently doesn't actually fit into the game well. With this game, though, I recommend getting it. The extra stuff does fit and makes it that much more fun. If you don't buy the CE, it's boring to get all the trophies, since the money is slow to come by, but it's doable. Not that I can get all the trophies anyway since I have yet to beat the naval ordinance mini-game, but I've managed 2 out of 3 skulls (you get skulls instead of stars for level ratings). Maybe someday. Meanwhile, it's avast for adventure and treasure, me hearties! Rated 5 out of 5 by garfield747 from Yoho Yoho Itsa Pirate's Life For Me Fun game, worth the effort and $$$. Not too hard. Only had to replay a few levels to get 3 Skulls. 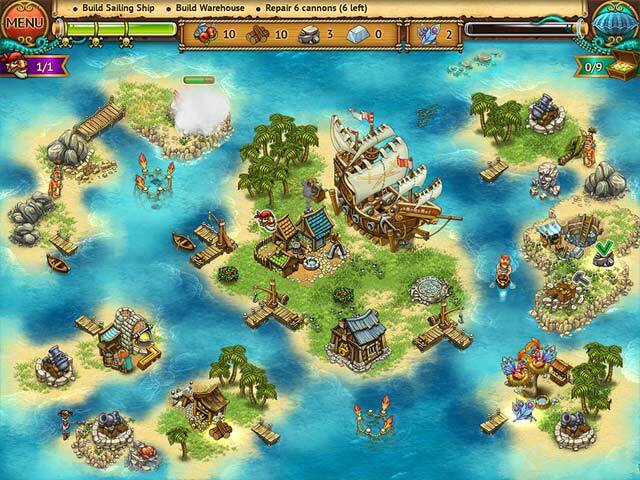 Having to build boats to get to other islands was the new twist for this genre. Overall, enjoyable, light entertainment. Rated 5 out of 5 by Maigeowl from Great game, not a fan of the story This game is really visually appealing, challenging, and long. The only thing i didn't enjoy was the cheesy romance story and the bad voice acting. Overall a fantastic game, i would totally recommend it and if a second one comes out, i'll definitely be buying it. Rated 5 out of 5 by honest2 from Thoroughly enjoyed it. Thoroughly enjoyed playing this game. It ran smoothly. Had some interesting scenes. Not too difficult - admittedly, I did have play on untimed mode because I had no chance of getting there in the time given. Constructive criticism alert - I would love it to be more colourful. Some sparkles would be nice. Underwater scenes were a welcome change. Also, found one man to a boat quite inadequate. Rated 5 out of 5 by hermette from Best Game In Some Time I'm not one that gives out 5 stars very easy, But I am with this game. Wish BigFish would get with it and promote more like it. Maybe 1 thing about the game is I wish there were more levels. You can easily go thru all the levels in a day. I replayed it many times already and look forward to replaying again to improve my accuracy. I really like it. Seems like ages I've been waiting for something like this, and now I want more. Rated 5 out of 5 by shaboody from Great time management game !! Bright colors, good background music, and a challenge. Rated 5 out of 5 by INGamePlayer from Sneak Attack After the trial I knew I would get this when the SE version came out, the only drawbacks being the inability to chain actions and I thought it might be too easy. I wasn't blown away by it, but I usually get this type of strategy game whenever available. After buying and getting further into the game, however, it quickly became one of my very favorites! The developers did a great job of introducing additional types of tasks and buildings one at a time, so you gradually get used to the increased difficulty. Eventually I was able to finish all the regular levels with three stars--a good accomplishment for this granny! I liked the balance of items gathered by boat, which takes longer, and others by land. And sometimes just as I thought I would never be able to get everything by sea in time, a land bridge would open up to make it faster. Even though it turned out to be a moot point since I got all the stars, I especially appreciated the fact that you don't have to finish the game perfectly in order to buy all the upgrades for your haven port. That has been so frustrating in other games when I just wasn't able to get one or more stars, especially if the failure was in one of the mini-game levels which I'd rather not even play. I also very much appreciated being able to replay the levels. 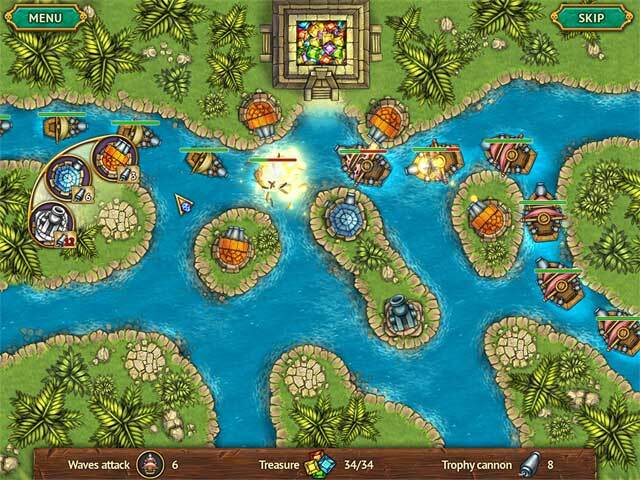 At first I was disappointed that the treasures that I found the first time I played a level were not available in subsequent tries, but it did allow me to concentrate on just completing the tasks without keeping an eye out for the extras. And if there were some that I missed the first time, they were still available to discover in the next try. I loved that if you hit Replay after finishing a level, the game doesn't make you experience or have to skip through the intro conversations to that level again--thanks developers! Spoiler Hint: If you see you are not going to finish the level in 3-star time with all the treasures, you can restart the level with all of them intact by clicking on the menu button, as long as your time has not completely run out. I loved the bright, cartoon-type graphics, and the picture automatically completely filled my wide-screen monitor. I can't comment on the music: I usually have it turned down so I can watch/listen to a baseball game at the same time! The only thing I didn't care for were the two mini-games that required navigating a moving sea while avoiding obstacles and shooting at other pirate ships, or just shooting at various opposing port holes as they opened. Too much reaction and dexterity with the mouse required as opposed to planning ahead, at least for this granny. I ended up skipping those two. But because of the leniency of the points system, that didn't ruin the game for me. All in all, I was quite "captured" by this game and look forward to playing again. Rated 5 out of 5 by judyj450 from it sneaks up on you! without a doubt this game is utterly awesome! at first i thought, ok, but kinda boring, then OMG it snuck up on me and surprised the daylights out of me. this is the best game i have played in a long, long time! i can't even begin to say enought about it. the graphics, music, storyline, just everything is top rate. i am soooo glad i got it and i did get the collector's edition and glad i did. this truly is the BEST! thanks BFG!